In their long-awaited eponymous debut album, Black Honey create their own cinematic world and invite us along for the ride. Four years: It’s either a long time or no time at all, depending on what you’re referring to. It’s a time period that can, depending on how you think about it, respectively feel like ages or the blink of an eye. NO matter how you spin it, though, most people would probably tend to agree that taking four years to not only define, but perfect your sound enough to release an album is a long time. But that’s just what Black Honey did. The foursome, originally hailing from Brighton, have been putting out music steadily for about that amount of time: at least, that’s when they first popped up on Atwood’s radar. Given their talent, they could have easily released their first album in a fraction of that time. Luckily for us, they chose not to do that, and spent that time writing music, fine-tuning their sound, building their fan base, and embracing their true inner weirdness. 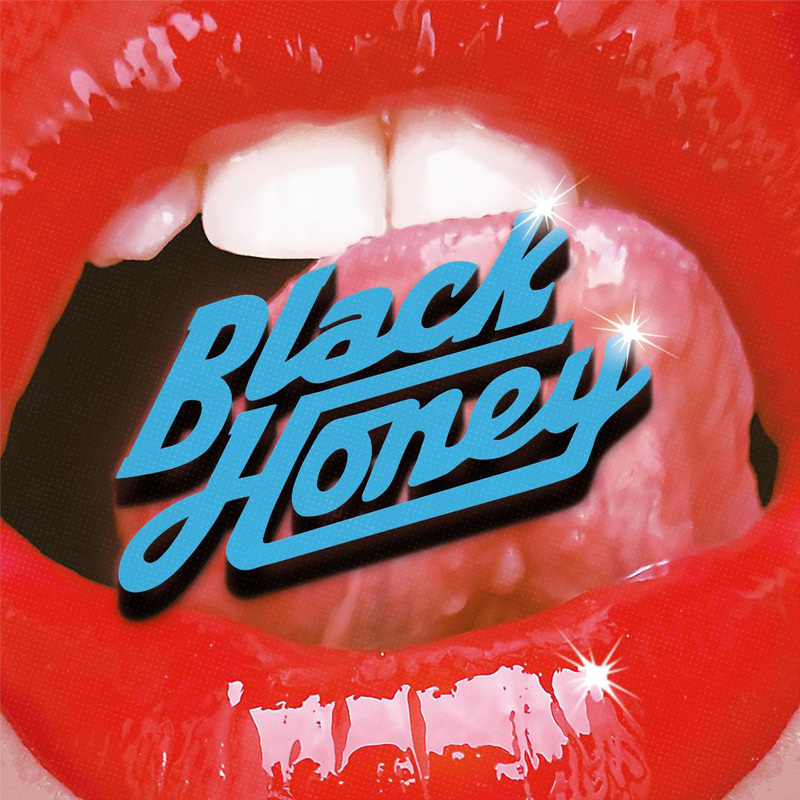 And all Black Honey’s meticulous effort has finally come to fruition in their long-awaited eponymous debut album, Black Honey (released September 21, 2018 via Foxfive Records). Creating an album with this much care and attention to detail warrants, in my opinion, a review that’s more thought-through than the average whip-it-up-in-one-afternoon hot take after listening to the album once. Some things in life demand more thought and attention, even if it means sacrificing the instant gratification of pounding out a review that’s published first and gets the most attention. Black Honey is, to me, one of those things. Since the band took several years perfecting this album, the least I could do was sit with it for a few weeks to let my thoughts and impressions coalesce into a review that’s (hopefully) better than something I’d form after a first, second, or third impression. And yet it’s the first impression of Black Honey that sticks. It’s a musical joyride through cinematic sounds, lyrics, and situations by way of pop and good old-fashioned rock n’ roll: An album that creates a world that wouldn’t be out of place on the silver screen and invites us to visit. Frontwoman Izzy Phillips is in complete creative control, and the result is an album that couldn’t have been created by anyone else. Black Honey is, at its core, Black Honey; an album that’s a perfect fingerprint of the band’s creative efforts up to this point. It’s a solid representation of who they are and what they can do, and speaking as a longtime fan, it’s a joy to listen to. We’re dropped right into the action as the album begins with “I Only Hurt The Ones I Love,” an homage to all things spaghetti western. Lyrically, it paints a picture of Phillips’ character, a woman who’s been wronged, but is now in control and not afraid of who she hurts or what she’ll sabotage. It’s not only the most logical song to open the album, but the best introduction to a theme of fated love and revenge that spans the album’s bend of genre. Here, and especially with the song’s accompanying music video, we’re dropped into revenge quest more intriguing and genre-bending than anything of Clint Eastwood’s. From there, it’s only natural that “Midnight” comes next. The disco-induced revenge fantasy that you’ll want to have playing on every night out (read more about that in my far-too-detailed breakdown of the song here), “Midnight” is now made complete with its own accompanying video. It wraps up the loose ends of the story introduced in the “Dig” video (or even “Hello Today”’s, depending on your opinion) in gloriously glittery fashion. It’s clear that director Shaun James Grant has been along for the ride the whole time, as the “Midnight” video is not only the perfect complement to the song, but perhaps acts as the crowning jewel of all the band’s videos to date, while fulfilling every Studio 54 fantasy you’ll ever have. “What Happened To You?” continues the upbeat vibe, but with a darker twist. Drummer Tom Dewhurst is at top form, and the result is a song that could be featured on the latest Madden game, its instrumentals are so pumped-up. It’s hard rock married to pop, paired with lyrics that border on the fated and dangerous. Though the song poses a question, we’re left with a feeling that Phillips already knows the answer…and that we don’t have to wait long for the answer. “Bad Friends” felt like a departure for the band when it was released as a single. The mixing sounded just electrical enough to feel stilted and off, and lyrically, it simply isn’t as strong as the rest of their music (though it is catchy as all get-out). However, “Bad Friends” fits like a puzzle piece into its place when taken with the rest of the album. There’s no other song that could follow “What Happened To You?” and sound its death knell so totally. Its deep, dangerous draw is the natural link between “What Happened To You?” and “Bad Romance,” and personally, its placement here lets me appreciate it more fully than I ever did when it was released as a single. Odd, isn’t it—that a simple sequence and placement can change a listener’s perception of an entire song. Yet it works. “Crowded City” brings us back to the present, zeroing in on life on the road that’s manage to recreate the feeling of being surrounded by people and yet completely alone. It’s a plea for times gone by and for returning to someone that feels like home that never gets caught up in its own sadness that you’ll keep singing long after it’s ended. And as an added bonus, “Crowded City” can also act as a love song to your metropolis of choice, or the place where you last fell in love. The “lows” of “Crowded City” get to greet a new day in “Hello Today.” An anthemic all-time fan favorite, “Hello Today”’s speaker is a new creation, one who’s left yesterday and bad lovers behind (admittedly by burying a tell-tale heart in the desert, as the music video expands on) for the realization that “God and Buddha love me too,” so who needs you? It’s a colossal kiss-off and yet is all the while positive throughout its soaring choruses: it’s no wonder Black Honey included it on the album. Fun fact about “Into The Nightmare”: Mike Kerr of Royal Blood, who Black Honey’s toured with, co-wrote the song. Which you probably didn’t need me to tell you—it’s a touch you can hear. “Into The Nightmare” (which the band has, at points, lovingly referred to as “Into the Mikemare”) has a distinctly Royal Blood-ian sound from its lyrics down to its backing harmonies. And yet it’s not just a collaboration: “Into The Nightmare” is wholly part of the album’s story and ecosystem, albeit with some Royal Blood-inspired touches. “Dig” slows things down again. Originally released as a single, it holds its own, but is given even more depth when paired with its music video (the backstory for all the action in “Midnight.”) The song itself alludes to all sorts of lies and betrayal, which the video simply expounds upon to draw you in even further to the song’s world. Deep bass and synthy sounds channel classic 80’s pop vibes we all know and love in “Just Calling.” In any other song today, “calling” might feel anachronistic, but here the line, like the song, mixes past and present to create something new. While “Just Calling” veers toward the repetitive, it doesn’t get any less catchy, making it at its core reminiscent of any classic ‘80s pop song. Any song that starts with “Oh my God, how am I here again?” is sure to be good. And that’s especially true for closing track “Wasting Time.” Slow and steady, it’s a little bit of everything Black Honey’s created up to this point. As Phillips weaves a vivid story of desperately pretending someone was another person entirely set to some of the album’s dreamiest instrumentals yet, all her talk of dreaming sets us gently back into reality. The honesty of admitting to wasting someone’s time, pretending they’re someone from the past is a bold statement on which to end an album, but Black Honey does so in cinematic enough fashion. Overall, “Wasting Time”’s honesty, clothed in swirling lyrics and matched with dream-rock-meets-orchestral overtones, brings the album to its denouement, its natural close. Roll credits, but no fear: it’s set itself up for a sequel. While it’s (*sound of writer struggling to admit this to herself*) not perfect—nothing is—this album meets the expectations raised by Black Honey’s taking of several years to perfect it. Black Honey puts Izzy Phillips’ creative mind on full display and takes us inside in spectacular fashion. Drawing heavily on sounds all at once cinematic, retro, and blindingly fresh, it’s a trip into the world referenced visually on the band’s early EP cover art. To borrow a line from the early single “Corrine,” Black Honey’s music creates “a movie” that up until now, “nobody else [has] ever see[n].” Black Honey invites us into that world that the band has alluded to in all their music, album art, and videos, and at the very least, it’s exceeded our expectations, big-time, by showing us, sonically, all that their world has to offer.